The reason for buying a portable generator may vary from person to person—one might want to power up tools on a remote jobsite, another to use for camping and recreation, or still another for backup electricity during a power outage—but if your reason for choosing a portable generator is portability then you'll want a generator that's truly portable. 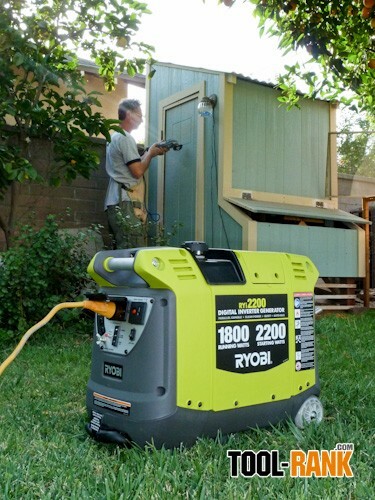 Weighing in at just over 50 lbs, the Ryobi RYi2200 is a great little power house with, as its name implies, up to 2200 watts of starting (surge) power, and 1800 watts of running (continuous) power. 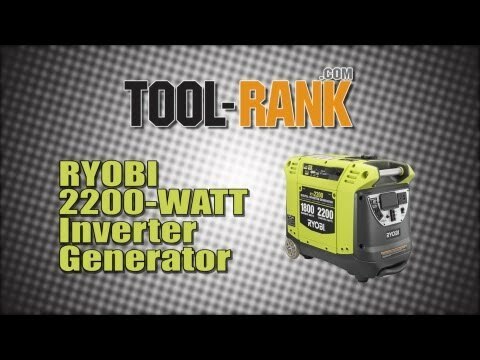 Simply put, if you had 18 lamps, each with a 100w bulb, this inverter generator could light them up; and Ryobi has managed to compact this much power into a unit that measures only about 17 inches tall, 21 inches long and about half as wide. And aiding to its portable size, this unit has two carrying grips which make it great for lifting and moving with another person; or, on smooth surfaces, the unit can be wheeled by the telescoping luggage style handle. The control panel located in front contains this unit's essential components: To supply its generated power, there are two 120 volt AC receptacles which resemble a regular household outlet. For DC power there is a 12 volt receptacle with a supplied cable for charging lead acid batteries. (This receptacle is protected by its own circuit breaker.) In addition, there are three LED displays; one indicating generator in use, one to alert if there is an overload, and one to warn of low oil. 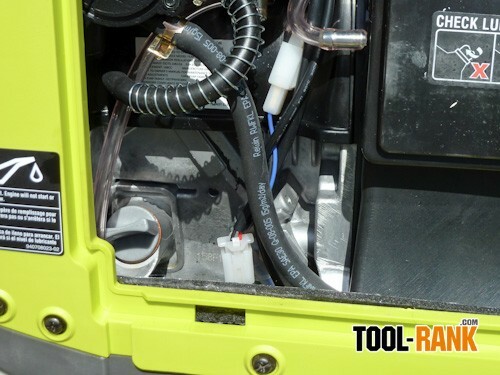 The control panel also features a receptacle for a parallel kit (not supplied) which would allow two Ryobi RYi2200 inverter generators to be linked together for greater output. The ground terminal and auto idle switch are also found here but I will describe these latter. I really like the ease at which this generator starts. There is no priming bulb to pump, no fuel valve to find and open, and no separate choke lever to pull. Simply, the Ryobi RYi2200 has one lever for stop, cold start and run, and with a couple of pulls on the starter rope, you're a plug away from having conversation-quiet power. Out-of-the-box first time starting will require a little more elbow to get fuel to the mechanical fuel pump, but once fuel is delivered through the system, the generator should start within six pulls even when cold. We found that one pull will usually do the job. 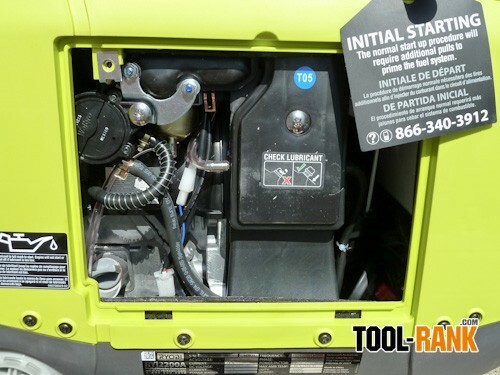 Once the RYi2200 is running, the auto idle switch can be turned on, the engine will settle into a quiet idle until a power load calls for increased RPM's. The engine throttles up automatically with the demand for more power. The engine will automatically shut off if the lubricant level falls below safe limits. During a recent rolling blackout, we put the RYi2200 to the test as back up power for an older 21.7 cu refrigerator. Drawing 6.5 amps through an extension cord, the fridge kicked up the generator only slightly from its idle speed. We also used the generator to power a circular saw for a remote building project. Again, the increase demand from idle speed was hardly noticeable. However, on a 12 inch miter saw, the overload light did flicker during initial start-up, but the saw itself showed no sign of power loss even while cutting 2X6's. If only job site temporary power could be as reliable. If I should mention any criticism, it would not be about the generator's function. It is very compact, so expectedly, access is a little tight. You should have a funnel with a flexible tube for filling the oil, (though a paper funnel is supplied). Fuel capacity is also limited, but one gallon of gasoline should give about five hours of run time at an idle. On another note, generators need to be grounded. This unit has a terminal for proper grounding, but to follow the National Electric Code guidelines to the letter would hardly allow this, or any generator to be portable. Can you imagine, every time you relocate the generator, driving a 5/8" steel rod 8 feet into the ground? (8' rod not included.) And as with any tool or appliance, the list of safety rules and precautions takes up more paper than should be necessary for anyone with a little common sense. The words Warning, Danger and Caution must outnumber Generator 10 to 1. 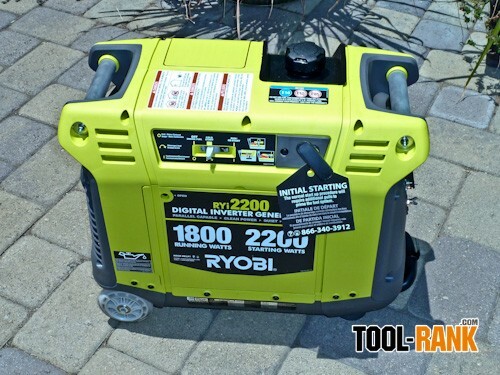 Generator supplied by Ryobi Tools for review with no preconditions.